No matter how much you plan, no matter how well-written your presentation, no matter how much you’ve rehearsed, mistakes during presentations will always occur. This is simply a part of being a public speaker. But how you handle unexpected occurrences is what will set you apart from other speech makers. Here, we’ll examine five of the most common speech “bloopers” and how you can respond to them and make a positive impression upon your audience. Speech Blunder #1: Your Microphone Fails to Work. This is one of those “uh, oh” moments that every speech maker is forced to face at some time during his or her career. If you’re speaking before an audience of approximately 100 persons (or less) in a room that has excellent acoustics, you may be able to get away without being miked. However, if you’re addressing a very large crowd or if your speech is being given out-of-doors, you may have to simply wait until someone fixes the problem. Don’t act flustered, though, and don’t become angry. Just relax and remain poised. If you appear to be in control, your listeners are less likely to become annoyed or antsy. Speech Blunder #2: You Say Something Inappropriate. Ooops. You said the wrong word. Or you told your audience something they didn’t need to know. Or you used foul language while fiddling with the overhead projector. Depending upon your gaffe, you may need to instantly apologize (especially if you uttered something particularly vulgar or offensive.) Alternately, if you made a “Freudian” slip, you may be able to make a joke out of your blooper. In either case, react quickly and don’t dwell on your slip of the tongue. First of all, this shouldn’t happen… but it inevitably does. Every presenter has a million and one items to remember for the day of his or her public speech, which means there’s a good chance something may be overlooked. As soon as you realise you are without your notes or outline, gauge whether it’s possible to have someone (a friend, significant other, colleague, et cetera) bring them to you. If there’s not time to retrieve them, you’ll have to quickly whip up a handwritten outline from memory. Sure, it won’t be as all-inclusive as your original talk, but if you’ve rehearsed your speech, you should be able to recall about 80% of what you were going to say. Never, never, never tell your audience that you forgot your notes, though. They don’t need to know and probably won’t notice. Speech Blunder #4: You Brought the Wrong Handouts. Similarly, if you inadvertently made copies of the wrong handouts or you brought handouts that were for another presentation, don’t beat yourself up. Simply avoid discussing handouts during your speech. Chances are, your listeners will never know they were supposed to have handouts, so it’s not that huge of a concern. It’s critical to remind yourself that dwelling on mistakes isn’t an option. 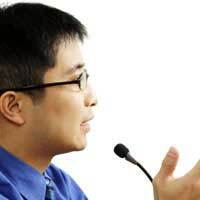 As a confident public speaker, you need to move past them and onto your next subject. Once you do, you’ll feel back in control and stronger than ever!